An anesthesiologist is a medical doctor who has been trained to safely administer anesthetics to induce a temporary loss of sensation or consciousness. This involves a variety of drugs ranging from local numbing agents to general anesthesia used to render unconsciousness. An anesthesiologist is a board-certified physician who has attained either a doctor of medicine (MD) or doctor osteopathic medicine (DO) degree and chose to specialize in the field of anesthesiology. Following medical school, an anesthesiologist candidate must complete four years of residency in a certified hospital-based program. Anesthesiologists are an integral part of the surgical team, which surgeons, surgical assistants, nurses, and surgical technologists. According to the Bureau of Labor Statistics (BLS), 30,590 anesthesiologists were practicing in the United States in 2017. The vast majority maintain private or group practices or are employed by general or surgical hospitals. The core function of anesthesiology is the practice of anesthesia. This involves the use of topical, injected, or inhaled medications to produce a loss of sensation. Without anesthesia, many surgical and non-surgical procedures would be intolerable or unfeasible. 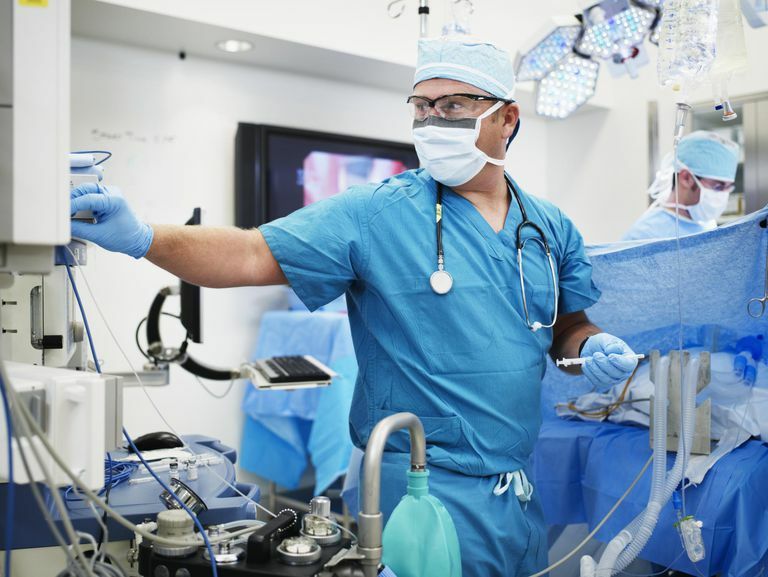 Anesthesiologists are also expected to have a broad general knowledge of all areas of medicine and surgery. In the United States, anesthesia care can be provided either by the anesthesiologist or a non-physician anesthesia practitioner directed by an anesthesiologist (usually for minor outpatient procedures). From a procedural viewpoint, an anesthesiologist's work starts well in advance of surgery. In recent decades, the role of the anesthesiologist has expanded beyond the administration of anesthesia to include an extensive assessment of a person's ability to tolerate anesthesia. By doing so, anesthesia can be delivered safely and recovery can be smoother and problem-free. Known as perioperative medicine, the approach involves the preoperative (before the operation), intraoperative (during the operation), and postoperative (after the operation) phases. The anesthesiologist would also review your medical file for relevant lab results, particularly blood panels, electrocardiogram (EKG) readings, chest X-rays, and stress test results. Equally important is the need to discuss any fears or questions a person may have about anesthesia to select the most appropriate form for the procedure and individual. It is the responsibility of the anesthesiologist to inform you about the possible risks and consequences of anesthesia. What Is the Risk of Death From Anesthesia? Depending on the type of anesthesia used, the patient would be prepped by the anesthesiologist, nurse, or surgical technologist. This may involve inserting an intravenous (IV) line into a vein or hooking you up to electrodes to monitor your heart and respiration. Depending on the condition being treated, an endotracheal tube may be inserted into your trachea (windpipe) to provide oxygen via mechanical ventilation. Throughout the operation, the anesthesiologist will monitor your vital signs (including heart rate, blood pressure, heart rhythm, body temperature, and breathing) to ensure that you are safe and your organs are functioning normally. Once the operation is complete, the anesthesiologist will cease the anesthetic, and you will be wheeled to the recovery room for further monitoring. Once you are aroused, you will be watched for side effects and complications and treated as needed. Depending on the type of anesthetic used and/or the duration of delivery, the anesthesiologist may conduct a separate postoperative assessment, checking for complications such as nausea, sore throat, dental injury, nerve injury, eye injury, altered lung function, or change in your mental status. Based on their expertise in regional anesthesia and nerve blocks, many anesthesiologists will pursue a career in pain medicine. This is typically an office-based practice focused on the treatment of chronic pain, including back pain, neck pain, migraines, headaches, and nerve pain, among others. Dental anesthesia is not a subspecialty of anesthesiology but rather of dentistry, with training and certification offered by the American Dental Board of Anesthesiology (ADBA). Because anesthesiologists are medical doctors, they must complete all of the education and training required of all physicians. This typically involves four years of college to attain an undergraduate degree, four years of graduate school to attain an MD or DO degree, and four years of a postgraduate residency. During residency, the anesthesiologist candidate will learn a variety of skills, including chronic and acute pain management, postoperative pain control, and intensive care pain management. Upon completion, many anesthesiologists will go on to complete a year-long fellowship in a subspecialty of personal interest. Upon graduation from medical school, the anesthesiologist candidate must first pass the U.S. Medical and Licensing Examination (USMLE). Individual subspecialties require further certification at the end of residency, obtained by the successful completion of a written and oral exam from the American Board of Anesthesiology (ABA). Fellows can achieve an additional ABA-board certification in the anesthesiology subspecialties of critical care, pain medicine, and hospice and palliative medicine. Licensing of anesthesiologists is required in all states. Requirements can vary, so contact your state licensing board for anesthesiologists for further details. Additionally, if your medical degree is from a school outside of the United States, you will need to pass the Educational Commission For Foreign Medical Graduates (ECFMG) exam. This includes a medical proficiency exam, verification of your medical degree, and, in some cases, a language test. Most people will only meet their anesthesiologist on the same day they are scheduled to have surgery. More often than not, the anesthesiologist will be chosen by your surgeon or the surgical Chief of Staff at the hospital. This doesn't mean that you cannot ask who your assigned anesthesiologist is or verify credentials on the ABA certification webpage. Will you or someone else be giving me anesthesia? Are there different options for anesthesia for my procedure? What are the chances of side effects or complications? Do I have medical conditions that place me at risk? Are there medications I need to stop before the operation? What are the eating restrictions? Be sure to bring the list of drugs, supplements, herbal remedies, and other medications you may be taking. It is equally important to find out if the anesthesiologist in on the in-network provider list of your health insurance policy. If not, you may find yourself having to pay some or all of the costs out of pocket. Many people assume that anesthesiology is a low-stress career given that you only see patients before an operation and shortly after. But the job can be extremely stressful when faced with people at an increased risk of complications, including the elderly and people who are critically ill.
To this end, an anesthesiologist needs to possess patience, empathy, attentiveness and listening and communications skills to make informed decisions based on the individual. As a career, anesthesiology can be extremely lucrative. According to the BLS, the median annual income for an anesthesiologist in 2017 was $$265,990. Those in private practice tend to be the highest earners, followed by anesthesiologists in outpatient clinics who have the highest patient turnover. Bureau of Labor Statistics. Occupational Employment and Wages, May 2017: 29-1061 Anesthesiologists. Washington, D.C.: U.S. Department of Labor; updated March 30, 2018.